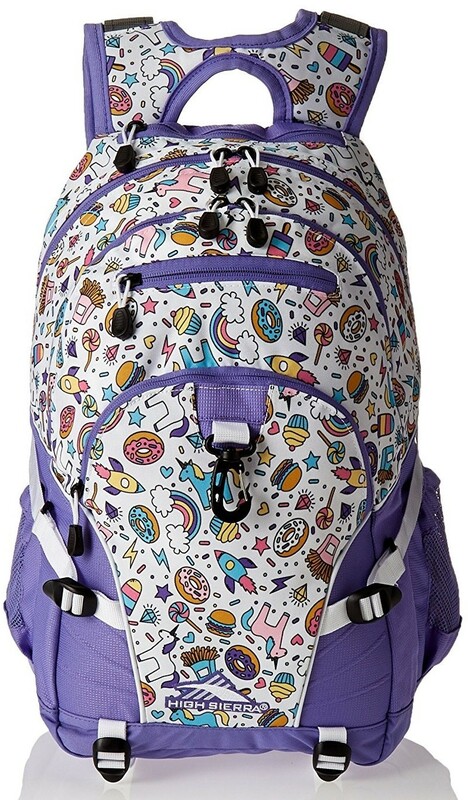 Our top 60 picks of backpacks for children and teens that reflect Mighty Girls' diverse interests in a wide range of colors and designs. Whether you're looking for a new backpack for school, need something to tote stuff for sleepovers, or want a heavy-duty, high-capacity daypack for hikes and traveling, it's important that the bag you pick can take everything your Mighty Girl has to throw at it! 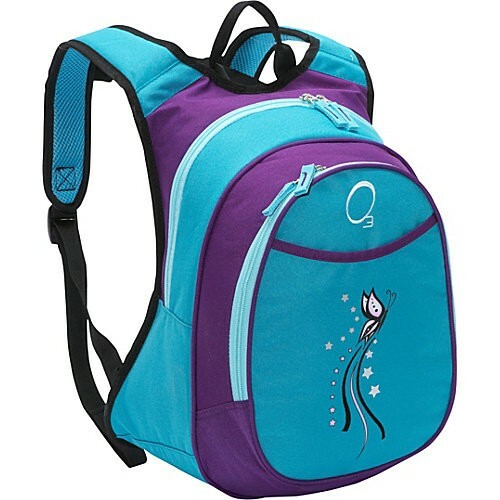 At the same time, backpacks are a fun way to reflect a child's interests and a tween's or teen's personality. The best backpacks are the ones that both go the distance and capture the wide array of interests of the Mighty Girls in our lives! With that in mind, we've put together a selection of our favorite backpacks for kids, from toddlers to teens. In the first half of this blog post, we've showcased a variety of backpacks in fun, colorful patterns that cover a wide variety of themes ranging from animals to science, and then in the second half, we've shared some of our favorite backpacks featuring Mighty Girl characters, including site favorites such as Wonder Woman, Moana, Star Wars, The Incredibles, Inside Out, and Doc McStuffins. We're confident there's one every Mighty Girl will love! These sturdy backpacks are perfectly designed for the littlest kids! With two sizes to choose from, one for 1 to 3 year olds and one for 3 to 6 year olds, you can get ones that's just right for your child's needs at daycare, preschool, or their kindergarten year. Colorful prints on durable canvas will make these bags a hit. "Fun meets function" with these cheerful backpacks from Skip Hop! These 10 by 12 inch backpacks feature dimensional accents, bright colors, and helpful organizational tools like an insulated snack pouch and a mesh bottle pocket. These backpacks are BPA, phthalate, and PVC-free and are available in over 20 different designs, from bees to raccoons to zebras. 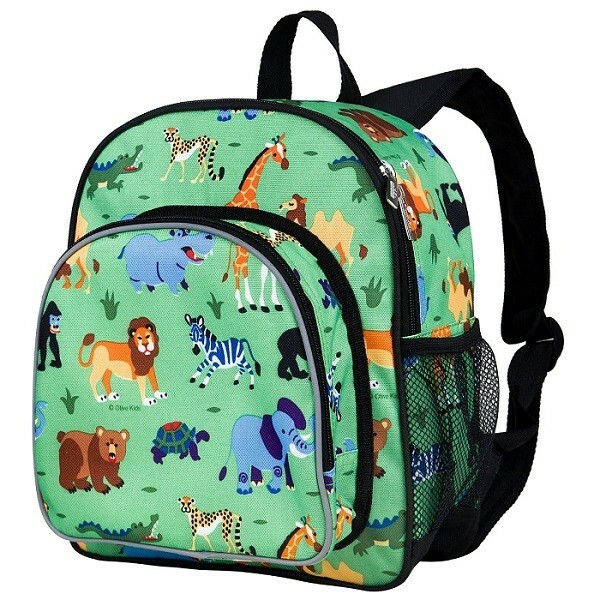 If your Mighty Girl also needs a lunch bag, you can get a matching Skip Hop Zoo Lunchies insulated bag. These 100% cotton exterior quilted backpacks from Stephen Joseph are perfect for kids on the go! These 12 by 9.5 inch backpacks have a magnetic closure that makes it quick and easy for little hands to access everything they need. The cotton exterior is easy to personalize with embroidery or patches. Kids will love the variety of colorful designs; parents will love the interior lining that makes cleanup a breeze. This is the perfect solution for active, busy kids! This compact backpack is only 10 by 14 inches, but it packs a lunch in an insulated cooler pocket, plenty of room for supplies in the main pocket and pencil organizer, and even a spot for a drink in the side drink pocket. Breathable mesh on the straps and lumbar section make it comfortable to wear, and it's available in over 20 bright colors and designs. She'll be able to carry everything she needs in one compact pack with this backpack from Wildkin, which includes an insulated, food-safe pocket for snacks. This compact 10 by 12 inch back includes a mesh pocket for a water bottle and reflective tape for night-time safety. Best of all are the fun designs, featuring everything from mermaids to dinosaurs. 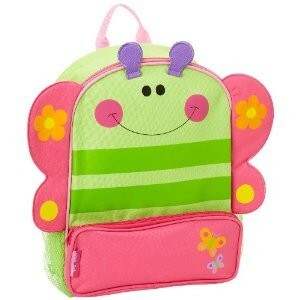 Head off to school with a friendly butterfly or ladybug on your back! These cute and colorful backpacks feature lots of pockets for storage and dimensional accents just for fun. At 13 by 10 inches, they're just enough bigger for the extra things a school-aged child needs, without being overwhelming on a small frame. One dollar from each backpack sold will be donated to a children's scholarship program. 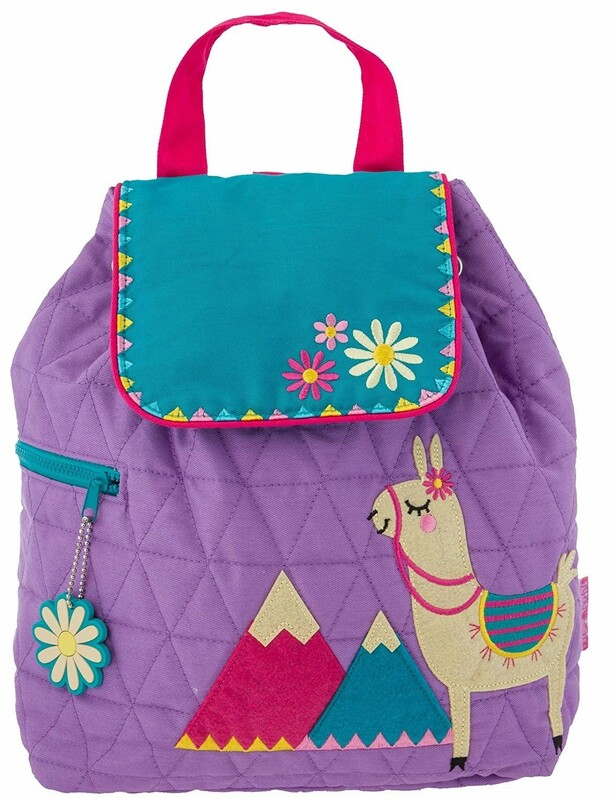 Pack your things in a colorful and eco-friendly backpack from Petit Collage! These 14 by 10 inch backpacks are made of 100% cotton canvas, coated with a protective, solvent-free biodegradable laminate made from natural polymers, which makes it wipeable and water resistant and is BPA, PVC, and phthalate-free. With a wide-opening main compartment and a side mesh pocket for water bottles, and plenty of vibrant patterns to choose from, it's sure to be a favorite. 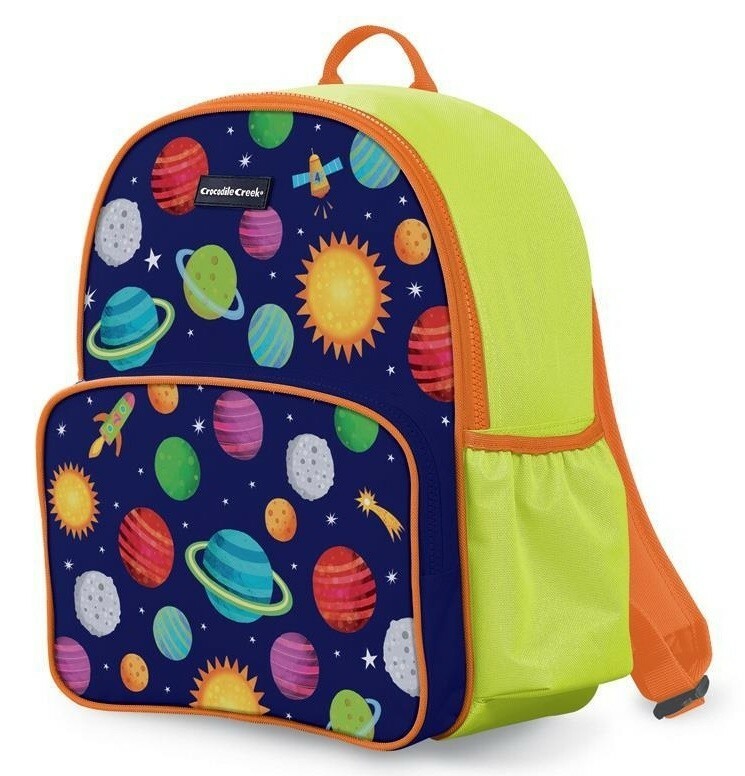 With a little more space for older preschoolers and kindergarten students, but still compact in size and colorful, Crocodile Creek's 14 by 12 inch backpack offers plenty of fun designs that kids will love. 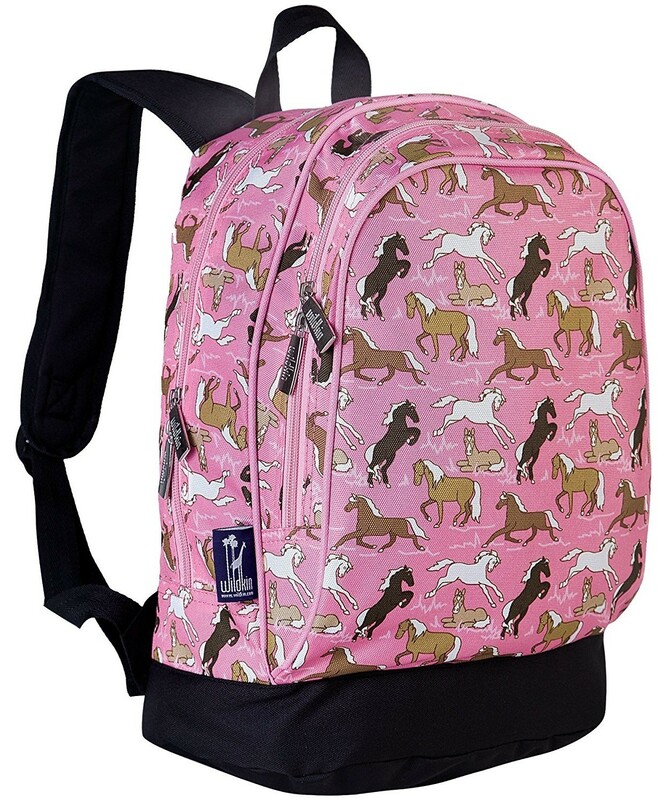 Horses, dinosaurs, and more adorn these high-quality backpacks, all in bright, kid-friendly colors. They're perfect for preschool, camp, and more. Who wouldn't love a backpack that turns them into a superhero? 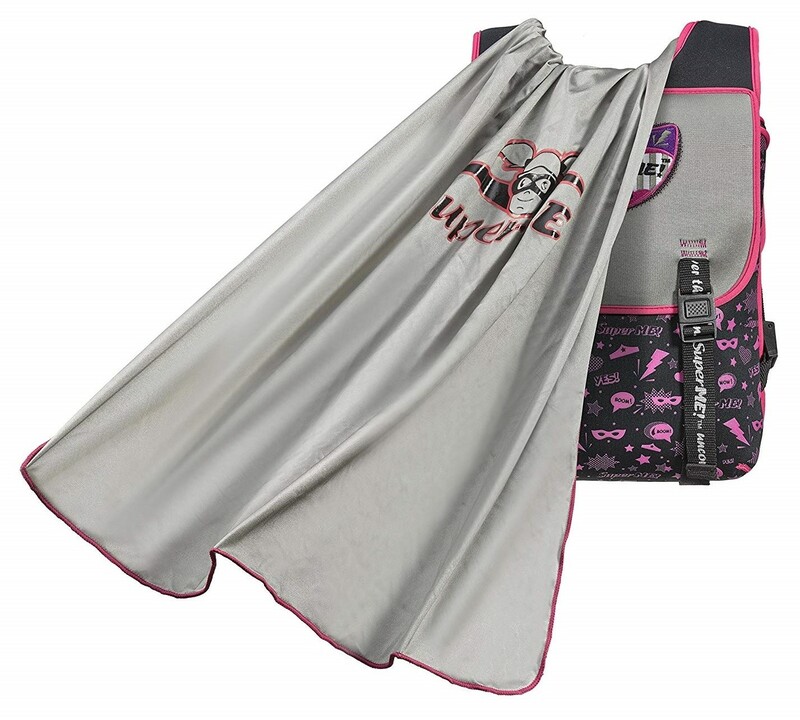 SuperME backpacks are bright and stylish, but they also hide a secret: a cape in a hidden pocket! Add the included coordinating mask and your little hero is ready for action. The backpack comes with a Velcro SuperME hero patch, but additional patches are available for sale to customize your bag. It's 11 by 13 inches, lightweight, and water resistant -- perfect for first adventures in the great wide world. 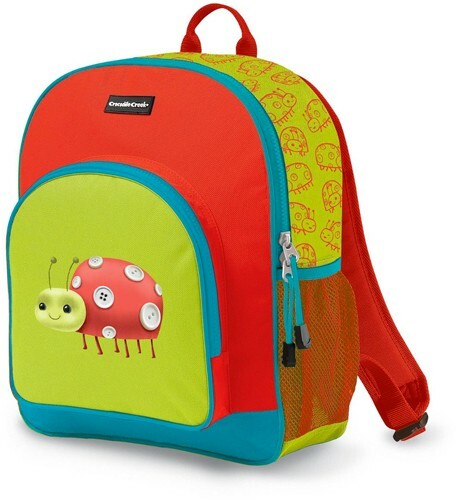 Send your child off to school in style with this adorable ladybug backpack from Crocodile Creek. Vibrant, fun colors and sturdy construction will make this a favorite! At 14 by 11.5 inches, it's compact enough for little kids to carry, but it offers plenty of space in its main compartment, front zippered pocket, and side mesh pockets. Plus, kids will love having the cheerful ladybug join them at school! 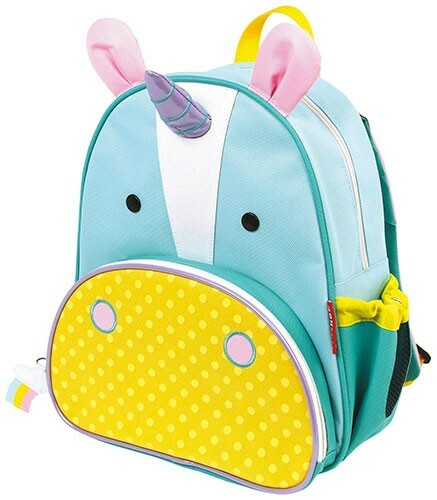 With fun, colorful designs featuring everything from animals to construction equipment, these compact backpacks are perfect for preschoolers to second graders! Whether your child loves space or mermaids, there's a pattern here for her. These 15 by 12 inch backpacks are made of 600 denier nylon so they're tough enough to stand up to a busy school year. From frogs to firetrucks, airplanes to cupcakes, horses to dinosaurs... there's a design here for every child! These 12 by 13 inch vinyl bags feature durable applique designs in bright colors. Big enough to hold some school books and papers, but small enough to be comfortable for younger kids, these backpacks are perfect for preschoolers to second graders. She'll be ready for back to school with these fun backpacks from Children's Place that let her show off her personality! 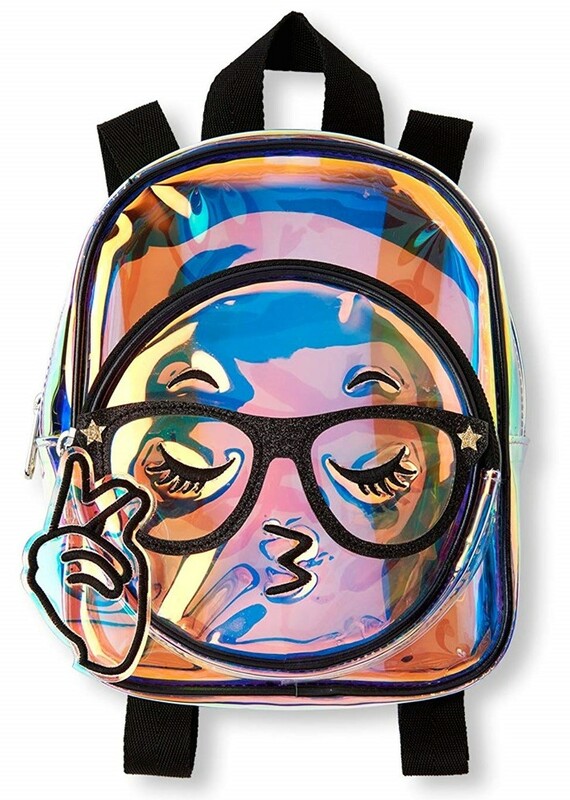 From holographic accents to funny emoji faces to cool details like patches and appliques, these backpacks will stand out. Each is 17.5 by 11.5 inches and has a main zippered pockets and a front zippered pocked; most designs have side pockets for water bottles, too. Plus, parents will love that these high-quality bags can hold up to a busy school year. 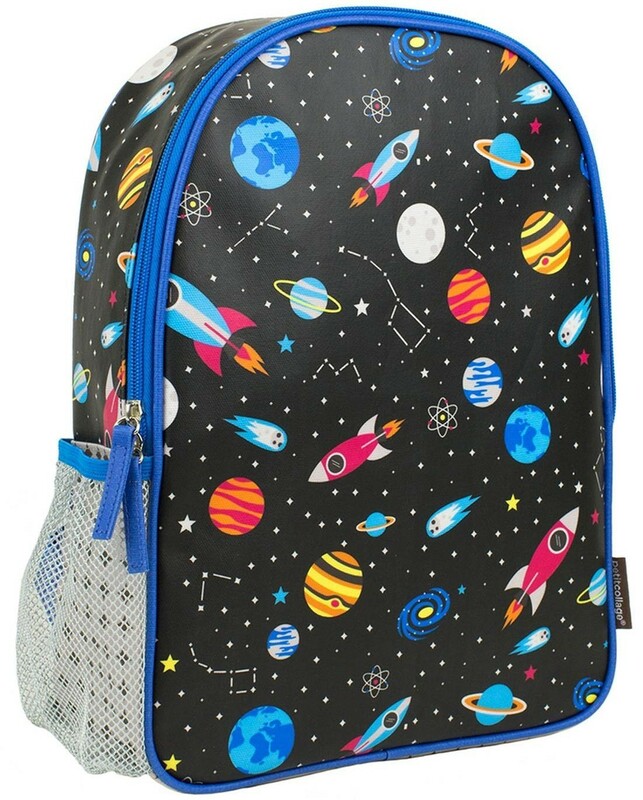 It's not just little kids who want to show off a love of outer space — and this space-themed backpack from hotstyle is the perfect option for tweens and teens! 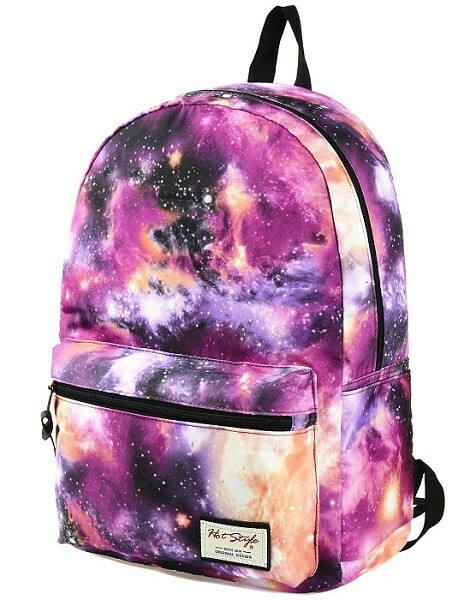 Vivid galaxy designs on this 16 by 12 inch backpack are available in four different colors. The large main compartment includes a padded 14 inch laptop sleeve and a back-wall zippered pocket for secure storage of small items. On the outside, there's a front zippered compartment, a zip pocket on the back for quick access to bus passes, IDs, etc., and two side pockets for water bottles, umbrellas, and more. 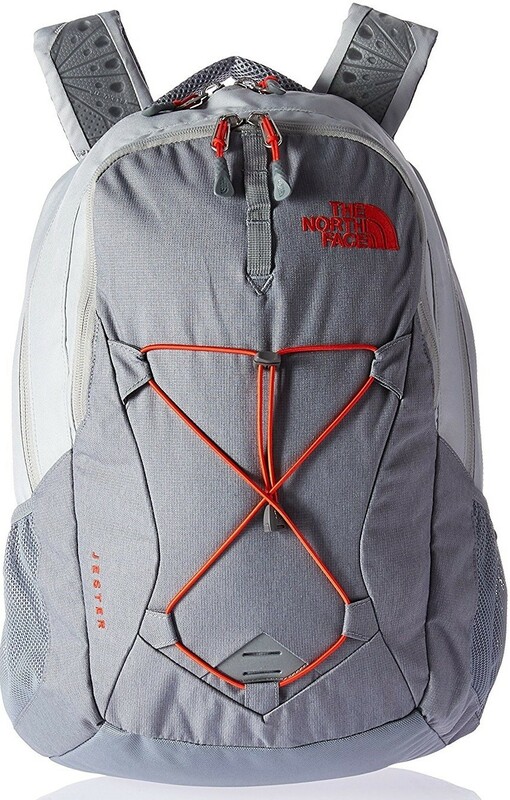 Whether you're off to school or hitting the trails, the 18 by 13.5 inch Jester backpack from The North Face is a great option! Two large zip pockets, a sleeve for a 12 inch laptop, and a front accessory pocket with an organization sleeve ensure you can keep plenty inside, while the bungee cords on the exterior allow you to loop in a rain jacket or other supplies. Plus, The North Face's FlexVent system ensures great ventilation when it's on your back, making it comfortable for the long haul. Get ready for a busy day or an overnight adventure with this daypack featuring a variety of unique prints! This 17.5 by 12 inch pack includes two large main pockets and a smaller outside pocket for items you might need to access quickly, like a phone, bus pass, and more. Tweens and teens will love the unexpected, colorful designs. With a variety of fun and inspiring prints, this casual daypack is the perfect choice for busy days on the go! This 17.75 by 12 inch daypack is made of high-grade 1200D waterproof nylon, and has two main zippered pockets and one front zippered pocket. 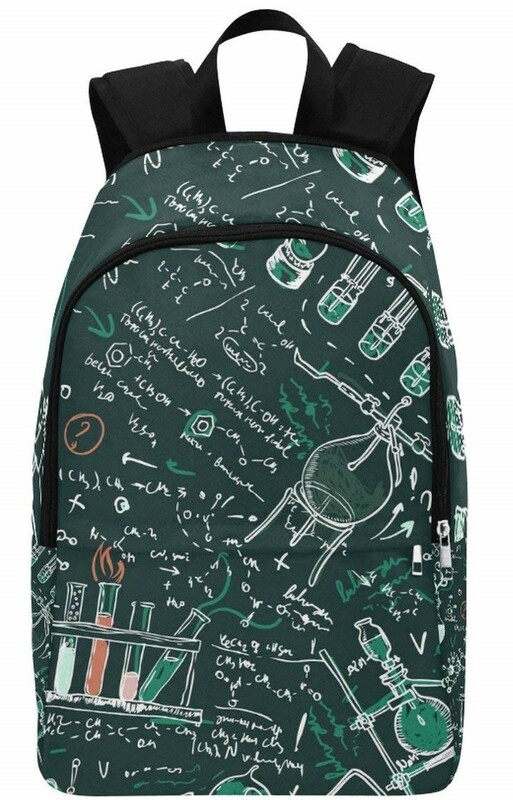 A padded back and adjustable shoulder straps make it comfortable to wear, while the choice of prints, featuring a wide range of interests from chemistry to music to anatomy and more, is sure to make it a favorite. Simple is beautiful with this backpack from J World that has clean lines but comes in a huge array of colorful patterns! This 17" by 13.5" pack can hold a 15" laptop safe inside its lined interior, while the exterior zippered pocket and two drink pockets keep other supplies close to hand. Ergonomically shaped, padded straps make it comfortable to carry, while the vivid designs will make it stand out. 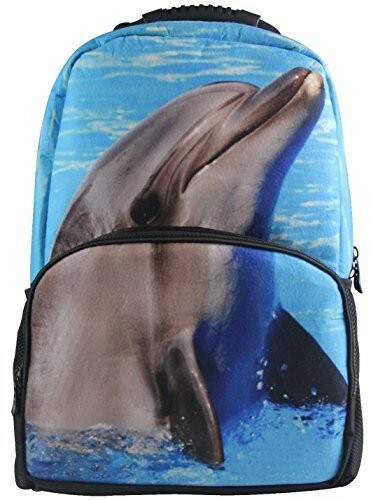 Lovers of ocean life will adore this backpack from Animal Face with a photorealistic dolphin print! The graphic is printed on felt fabric, giving it a sense of depth that adds to the realism of the image. At the same time, this 17 by 12 inch backpack doesn't sacrifice carrying space, providing both a large main pocket and an exterior pocket that's perfect for pens, pencils, calculators, and other supplies. 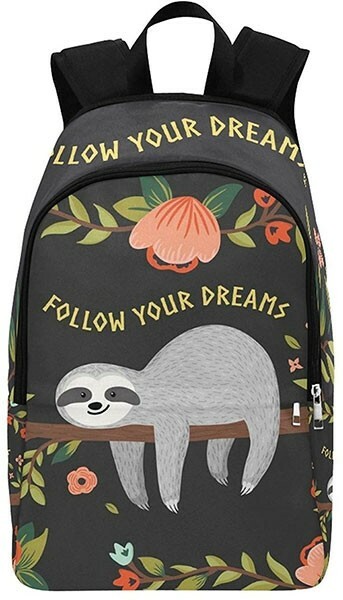 With sleepy sloths, intriguing equations, music notation, and more, there are plenty of unique prints to choose from for this daypack. At 17.5 by 12 inches, it's the perfect size for a long day or an overnight trip, and the 1200 denier waterproof nylon ensures all of your stuff stays clean and dry. Two large, lined main compartments and one small front pocket provide plenty of organization, but the real appeal will be the fun designs! Make her school days magical with bright sequins and vibrant prints with this beautiful backpack! This 18 by 14 inch backpack has a big main compartment for all her supplies, plus a front zippered pocket for items she needs to access on the go. Comfortable and colorful, this will help her feel ready to shine every day! 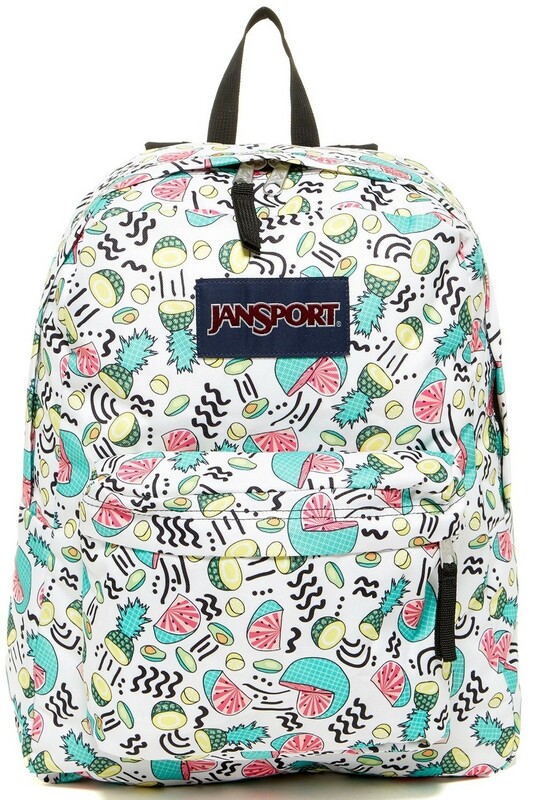 Chances are this backpack will look familiar — Jansport has been making popular gear for 30 years! 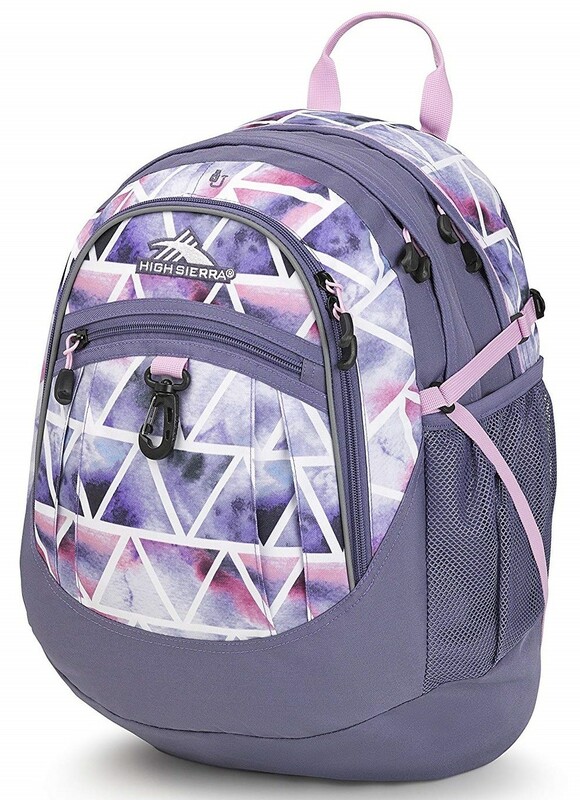 The SuperBreak backpack comes in a wide variety of colors and designs and is one of their most popular products, and it's easy to see why: at 17 by 13 inches, with comfortable padded straps, it's perfect for carrying a day's worth of supplies. Best of all, Jansport offers a lifetime warranty on all their products. High Sierra's Loop backpack is perfect for day-to-day or for more adventurous journeys! This large, multi-compartment backpack is 19 by 13 inches, and includes a dedicated tech compartment for a laptop or tablet, as well as a media pocket with a headphone port. You can even carry extra gear with the heavy-duty hook and bottom straps. Over three dozen colors and designs provide her with lots of choices. 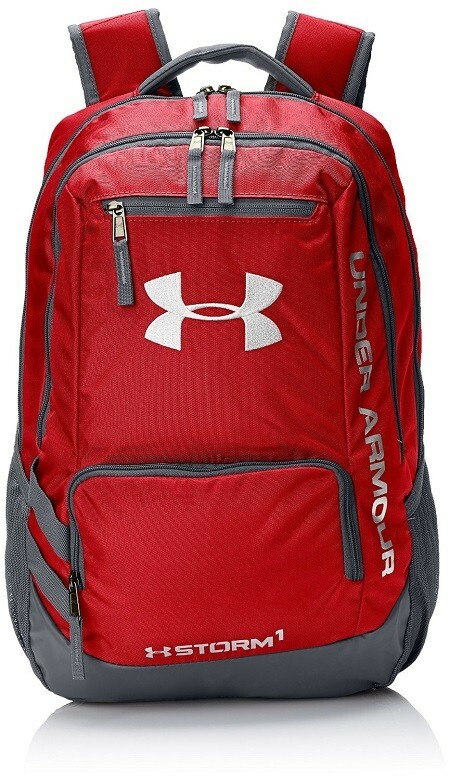 Your teen need a backpack that can handle anything she can throw at it — and this backpack from Under Armour delivers! Made with UA Storm material that resists water without sacrificing breathability, this 18 by 13 inch backpack includes a laptop sleeve that can hold a 15" laptop. Adjustable, padded straps make it comfortable to wear, and she'll love the 18 vivid colors and patterns. If your Mighty Girl has a walk to school, you may need a backpack that can handle the worst of the elements. This 18 by 14 inch backpack from Eshops is truly waterproof, not just water resistant; if the zippers are probably closed, things will stay properly dry even in a downpour! With comfortable shoulder straps and multiple pockets for organization, this backpack is also perfect for long hikes or overnight stays. You can pack a lot in this oversized, multi-compartment backpack design from High Sierra! At 19.5 by 13 inches, there's little that won't fit — including your laptop or tablet, in a dedicated tech sleeve. You can even bring along your music with a media pocket with headphone port! High Sierra's monster hook and bottom straps allow you to bring along extra gear that won't fit in the pockets. With a wide variety of modern, bright designs, she's sure to find one she'll love. If your child has a favorite Mighty Girl character, why not let her show her off on her backpack? 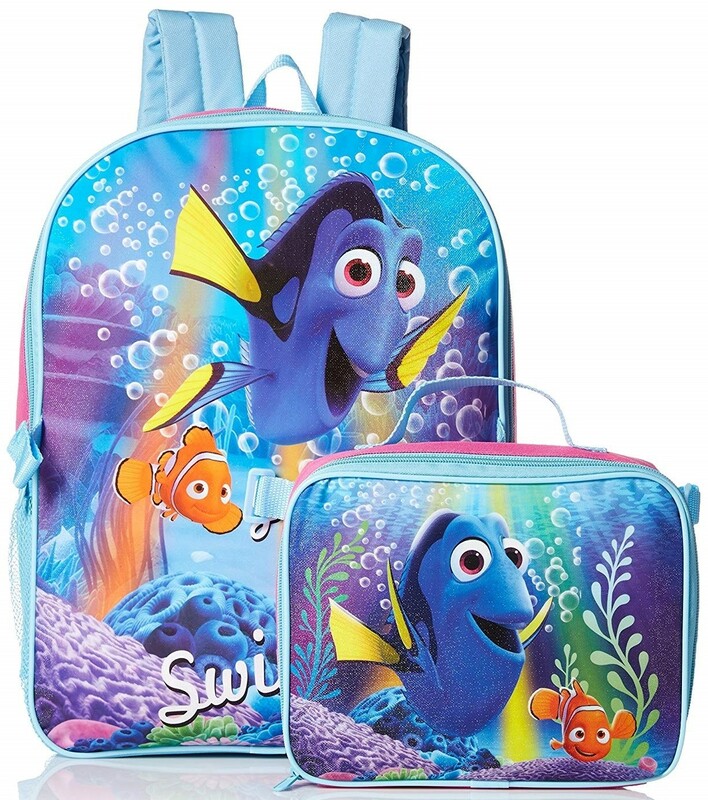 These backpacks feature a variety of fun licensed characters. 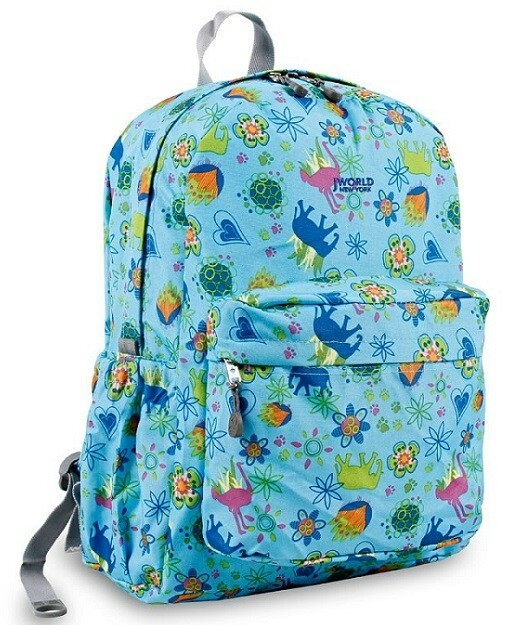 Everyone's favorite forgetful fish makes an appearance on this backpack that's just the right size for toddlers and preschoolers! 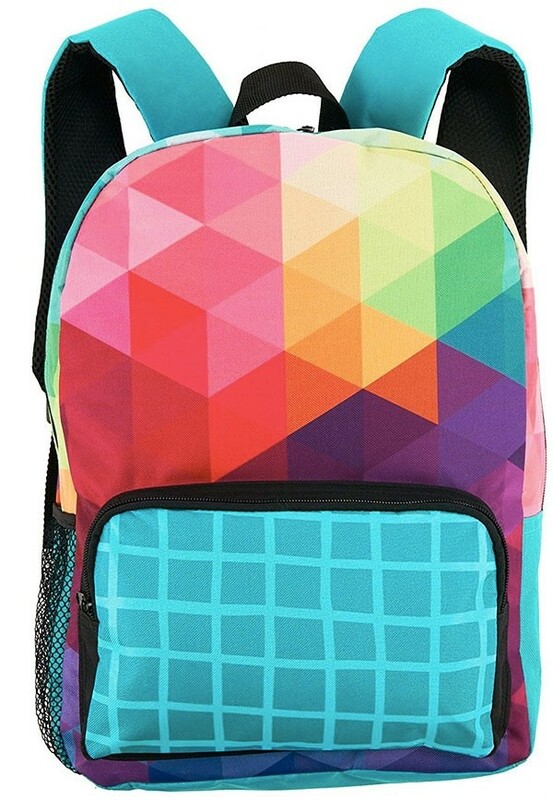 This 12 by 10 inch backpack is colorful and provides plenty of organization with a double-zippered main pocket, two front zippered pockets, a side Velcro-closure pocket, and a side mesh pocket. It's perfect for all her amazing adventures. Explore a new school year with Dora the Explorer and her friend Boots! This 10 by 8 inch backpack is perfectly sized for toddlers and preschoolers, and has a main zippered compartment, a front zippered pocket, and two side pockets for water bottles. It's the perfect choice for a school year of adventure! Add a little Endorian flair to your day with this plush Wicket backpack! 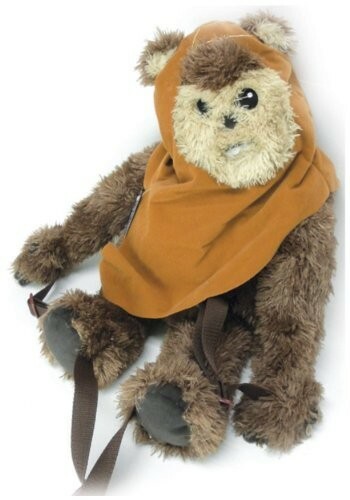 This cuddly plush is 24 inches tall and hides a little carrying pouch that's just the right size for a few key supplies. 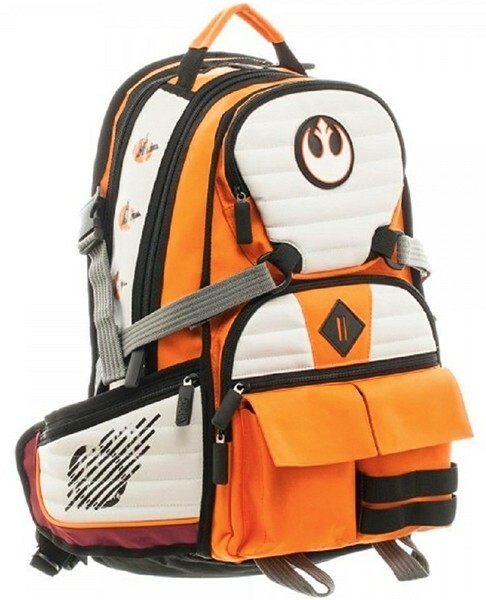 The adjustable straps make this perfect for all ages, whether you've got a preschooler Star Wars fan or you're eyeing it as a distinctive alternative to a purse for yourself. 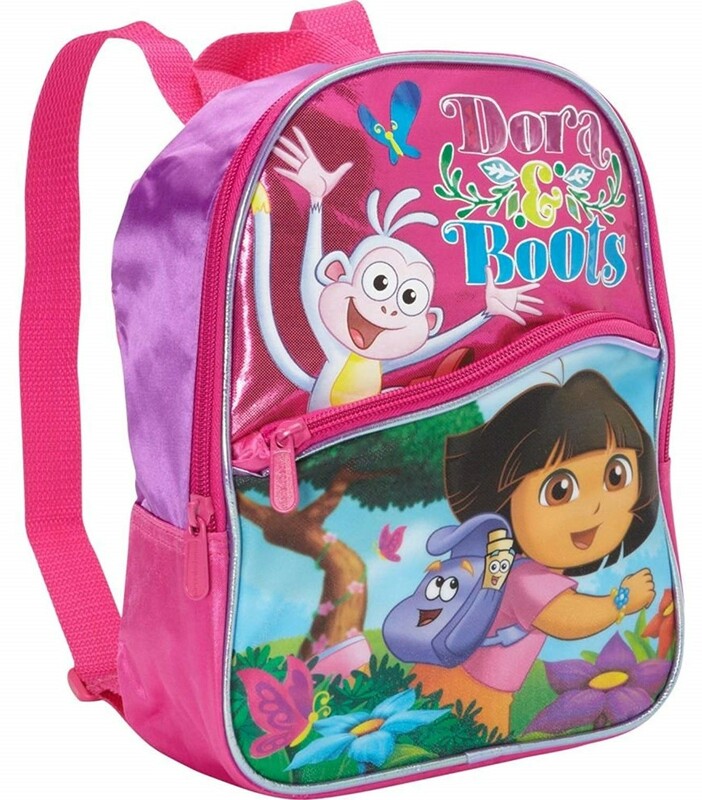 Get ready to explore with this backpack featuring Dora the Explorer, her friend Boots, and some colorful crayons! 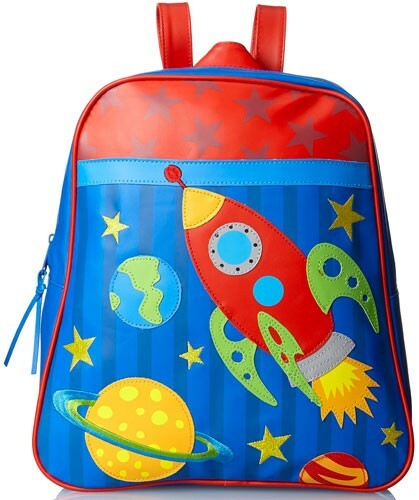 This officially licensed backpack is 14 by 10.5 inches, big enough to carry a bit more but still small enough to be comfortable to carry for smaller children. Two front zippered pockets make it easy to carry everything she needs — Map not included! Who wouldn't smile to see Olaf's grin every morning? 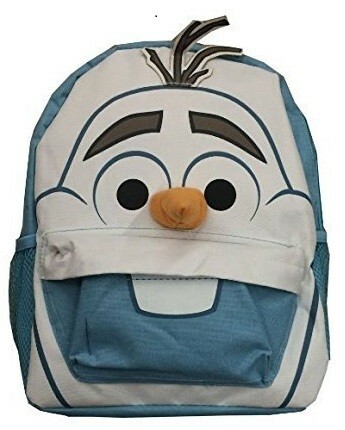 This nylon backpack uses dimensional accents to add a little extra something to the Frozen character's design. At 12 by 10 inches, with an 8 by 10 inch pocket, it's big enough to carry the necessities — whether it's winter or summer! Two side mesh pockets let you tote a drink too. 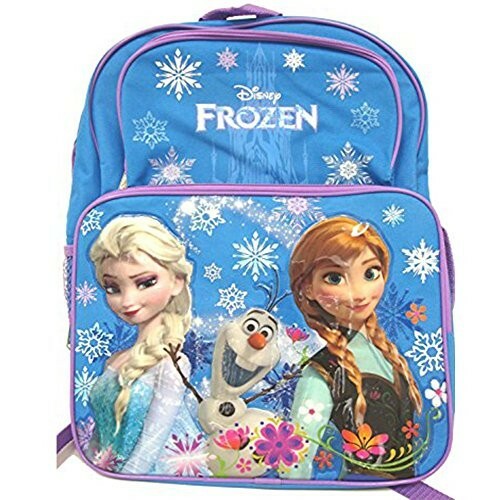 Anna and Elsa can inspire you for a busy school year with this American Tourister backpack featuring the loving sisters from Frozen! 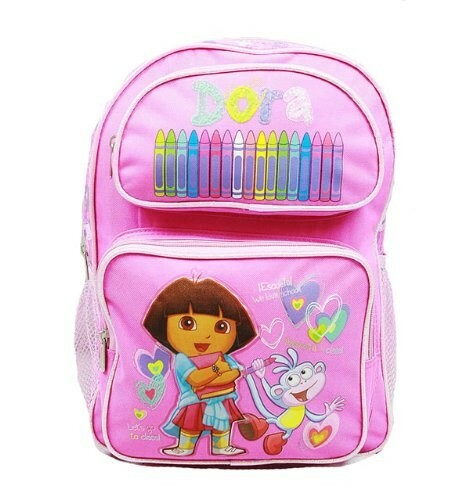 This 14 by 8 inch backpack is compact enough to be comfortable for younger kids, but with a large main compartment, large front zippered pocket with organizer, and side mesh water bottle pockets, it's got plenty of space or everything she needs. Plus, parents will love the 10-year warranty that ensures you know it can hold up. The exuberant Vampirina can be your Mighty Girl's daily companion with this officially licensed backpack and lunch bag set! 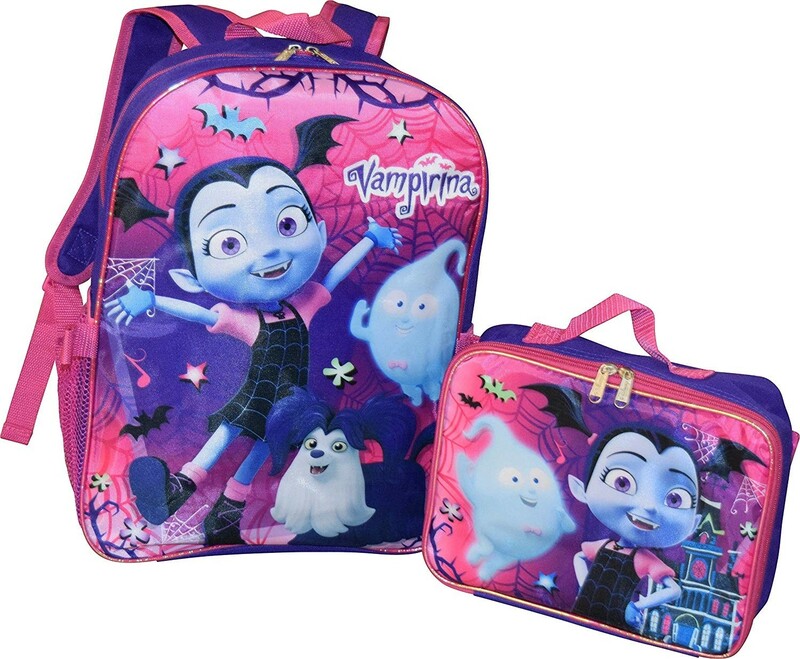 The 16 by 12 inch backpack features a graphic of Vampirina and Demi, with the text "An unbelievable friend"; it includes adjustable straps, a small zippered outer pocket, and side mesh pockets for water bottles. The 9 by 7.5 inch lunch bag, which clips on to the backpack for easy transportation, features Vampirina and her friends Poppy Peepleson and Bridget. Younger fans can also check out this Vampirina Mini Backpack. 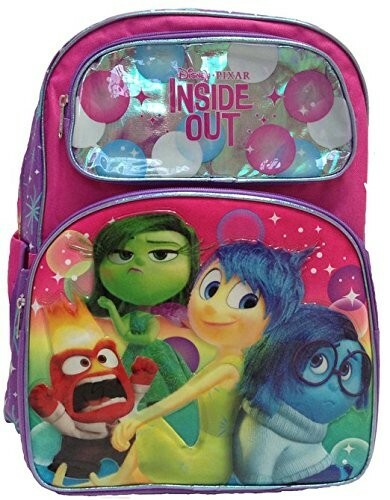 Celebrate her love of the Disney-Pixar movie Inside Out with this backpack featuring Disgust, Joy, Anger, and Sadness! This 16 by 12 inch backpack has two front zippered pockets, a side Velcro-closure pocket, and a mesh side pocket, making it perfect for carrying everything she needs for a day that's full of emotions. 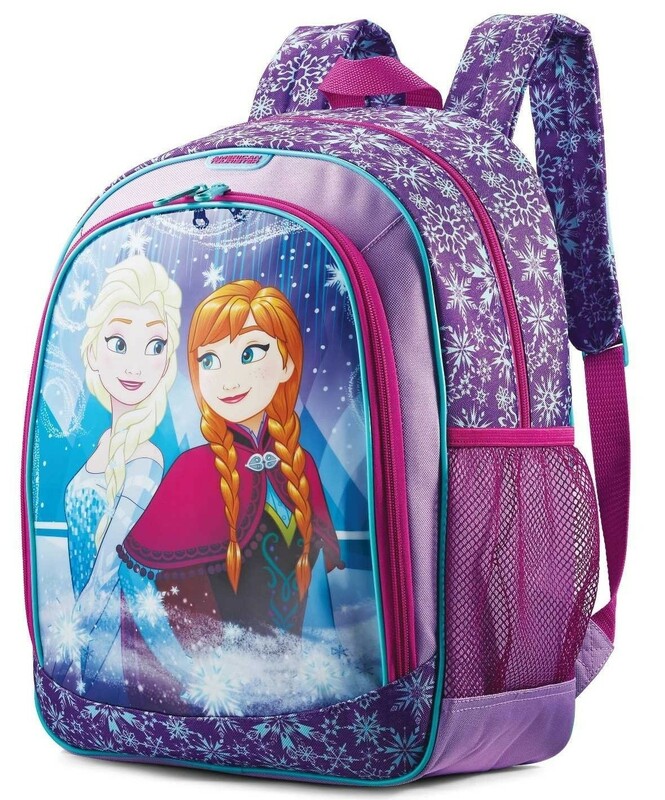 Three of the stars of the hit movie Frozen appear on this beautiful backpack! This blue 16 by 12 inch backpack has a main compartment and two front zippered pockets, as well as a side mesh pocket and a side flip-top pocket, so there's plenty of room for everything — but what she'll love is getting to see Anna, Elsa, and Olaf every day on her way to school! 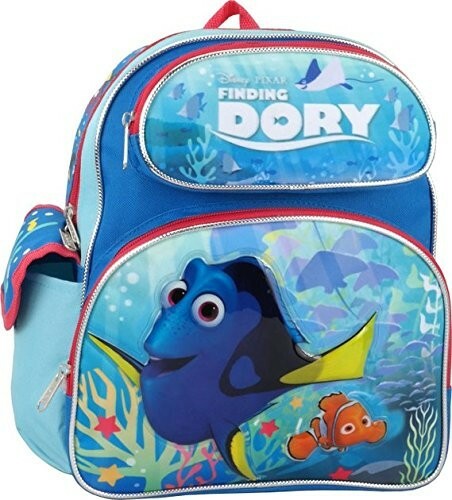 Take a little advice from your favorite forgetful fish with this Finding Dory backpack and lunch bag set! 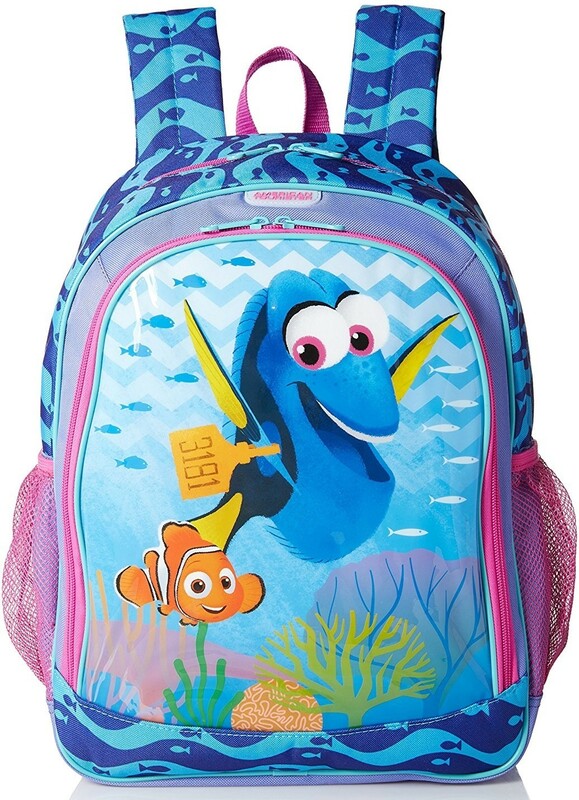 The 16 by 12 inch backpack is 100% polyester and features a colorful print of Dory and Nemo with her motto, "Just keep swimming!" Meanwhile, the 9.25 by 7.25 inch insulated lunch bag helps keep food at just the right temperature until it's time to eat. The two bags snap together to make it easy to carry everything she needs. 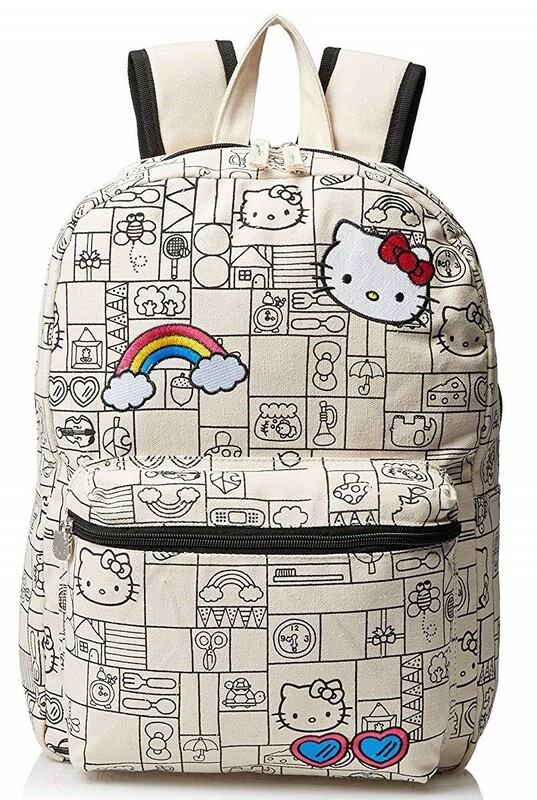 Fans of Hello Kitty will smile every time they put on this backpack with a Hello Kitty print! This 16 by 12 inch backpack is made from sturdy, water-resistant canvas material and includes a large main pocket and a zippered front pocket, providing plenty of storage for day-to-day necessities. 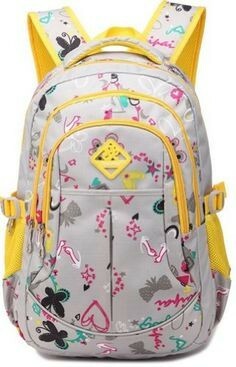 Kids will love the subtle print in black outlines on the backpack, as well as the pop of color provided by the embroidered accents, including one of Hello Kitty's trademark bows stitched on one of the straps. This backpack is the perfect fit for your little adventurer! 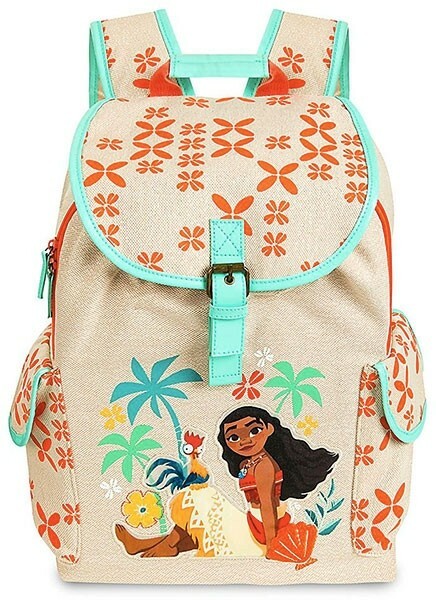 Made of textured fabric that looks like weaving, with colorful images of Moana and Heihei, this vibrant 17 by 14 inch backpack will really stand out. One large main compartment and two side pockets provide plenty of storage for all her adventuring gear. For more products featuring this popular character, visit our Moana Collection. Accio backpack! She can have a magical year even if she isn't off to platform 9 3/4 thanks to this officially licensed knapsack. 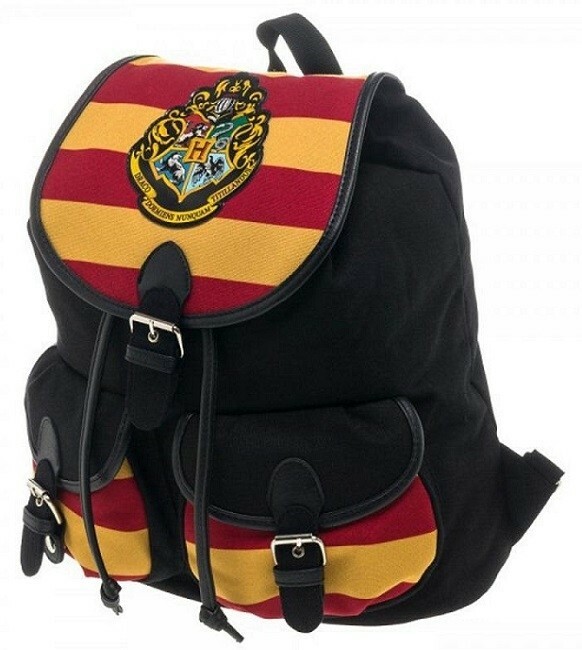 This 16 by 14 inch bag includes a vibrant Hogwarts crest and features several outer pockets for quick access to things like bus passes, student IDs, and more. 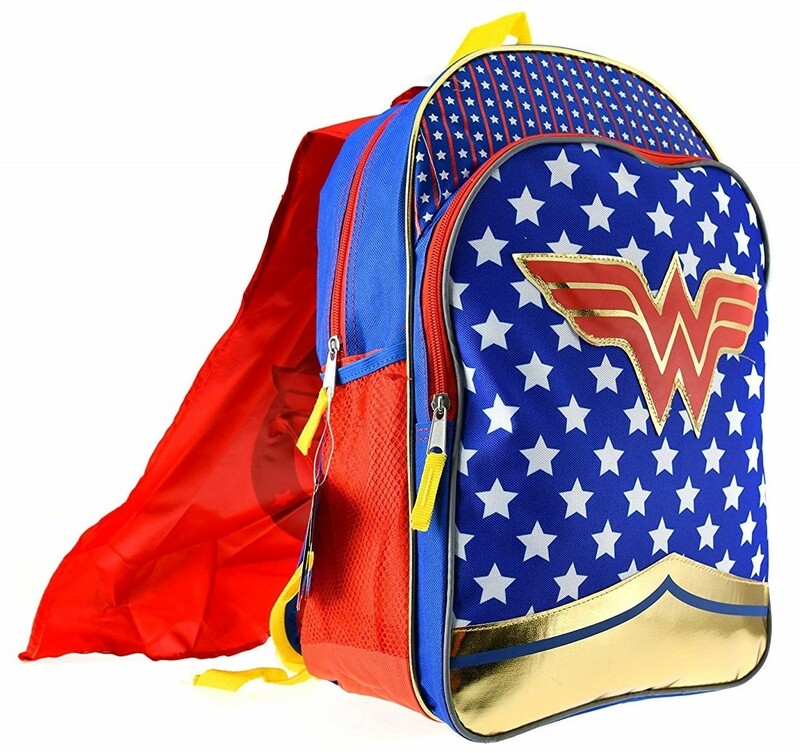 Get ready for a heroic school year with this Wonder Woman backpack with its own detachable cape! 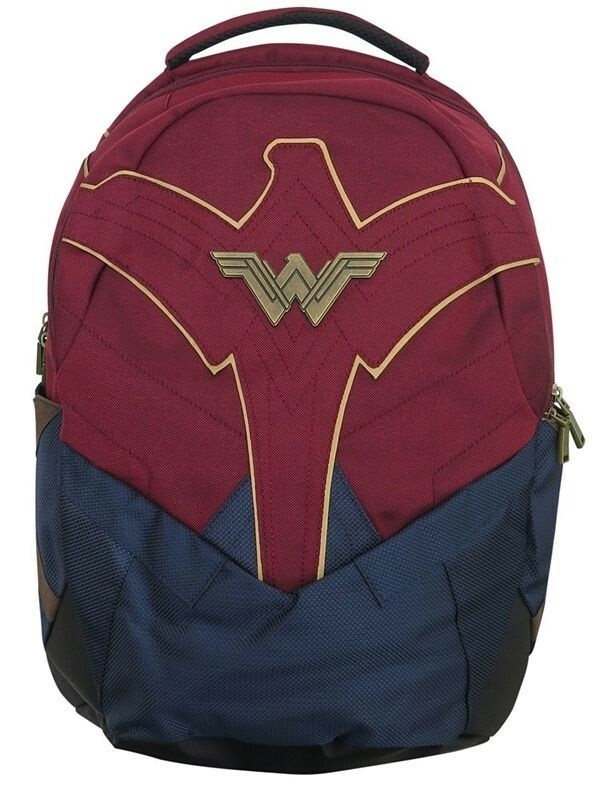 This 16 by 12 inch backpack features iconic Wonder Woman styling, complete with gold foil accents. It has a large main compartment, a front zipper pocket, and two side pockets for items like water bottles. The cape, of course, will be every young Wonder Woman fan's favorite part! 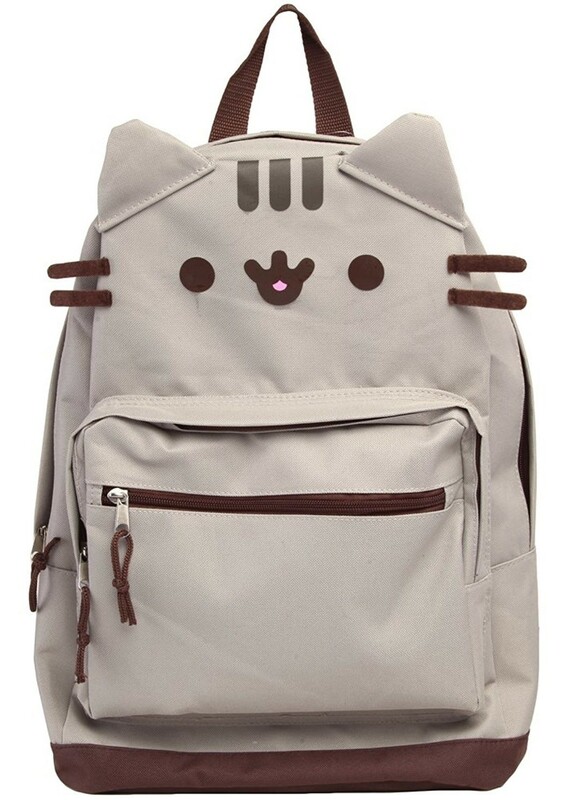 Let Pusheen's friendly face keep you company during a busy school year! 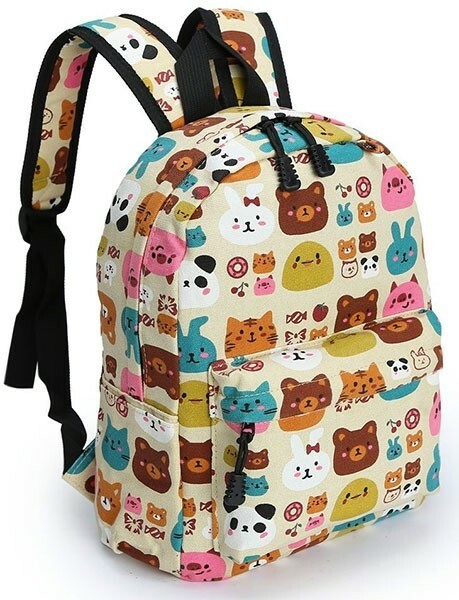 This 100% polyester, 17 by 12 inch backpack features dimensional features, including Pusheen's ears and whiskers. Adjustable shoulder straps keep it comfortable, while a large main zippered compartment and two front zippered pockets help kids keep things organized. Kids will love the friendly face, while parents will love how durable this backpack is, perfect for toting everything she needs. Sssssss....BOOM! 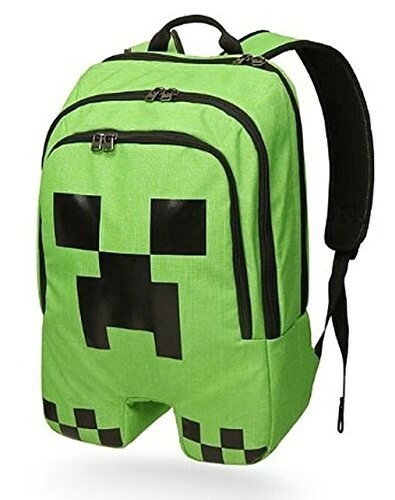 Minecraft fans will love this Creeper backpack. This 18 by 12 inch backpack is huge both in size and organization: three big double-zippered compartments, some with organizers pockets, provide plenty of places to keep things. It's one creeper you'll be happy to see! An incredible year calls for an Incredibles backpack! Fans of Elastigirl and Violet will love this officially licensed Incredibles backpack, with a bold design worth of Edna mode. At 19 by 15 inches, it's got space for everything (including her super suit) and front zippered pockets and two side pockets provide even more places to tuck things. An interior ID label preserves her secret identity while ensuring that this backpack makes it home. 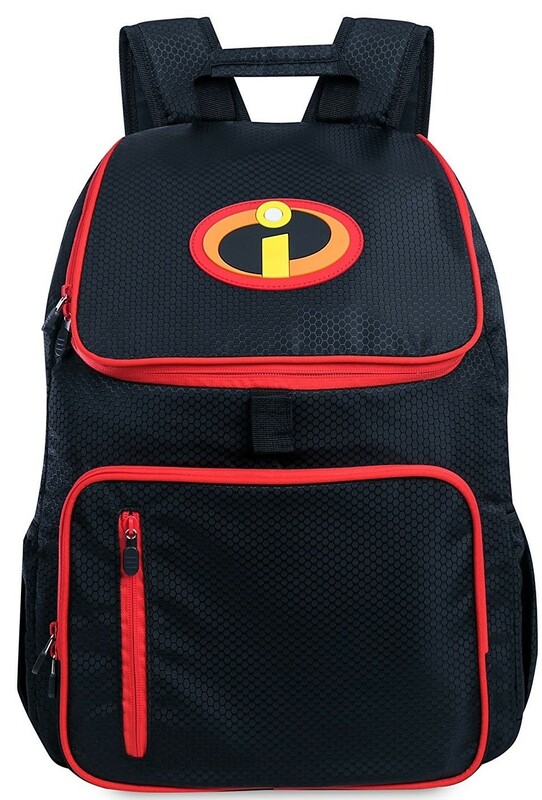 Incredibles fans can also check out this Incredibles backpack from Jansport. You'll feel like Wonder Woman, whether you're off to school or out on a hike, when you're carrying this sturdy vintage-style canvas rucksack! This rugged backpack, which comes in several colors, features a large main compartment, ideal for hiking gear, books, iPad, tablets, laptops, and so much more, along with 3 exterior pockets fit for water bottles, keys, camera, and even your wallet. At 16.25" x 13.5" x 5.25" it's compact but still holds everything you need, and it features a drawstring and extra wide flap to keep your valuables secure. Without the Ewoks, the Rebellion would never have succeeded! 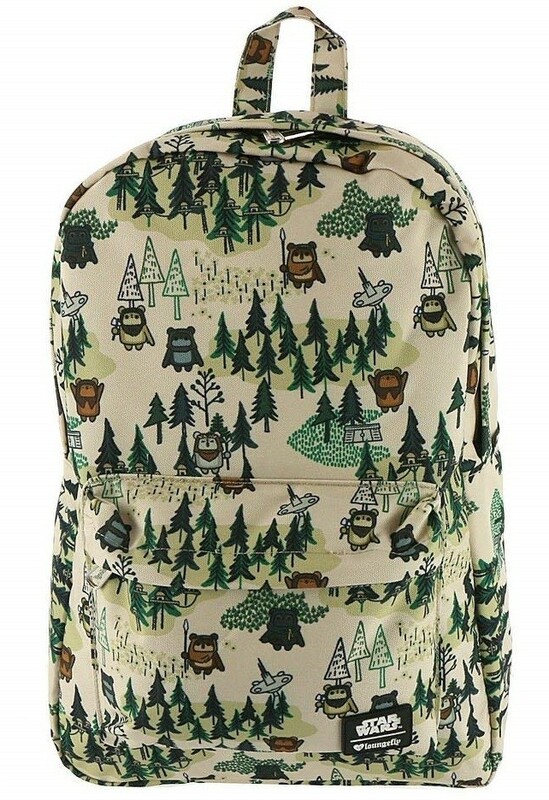 This Ewok Forest Festival backpack from Loungefly features a unique print on a heavy duty nylon base. The fully lined interior includes a laptop pocket and a top-zip closure, while a front zippered pocket provides easy access to items you need on the go. Dual reinforced, padded shoulder straps make it comfortable to wear — no matter how many books she's carrying! It's sure to be a hit with any Star Wars fan. 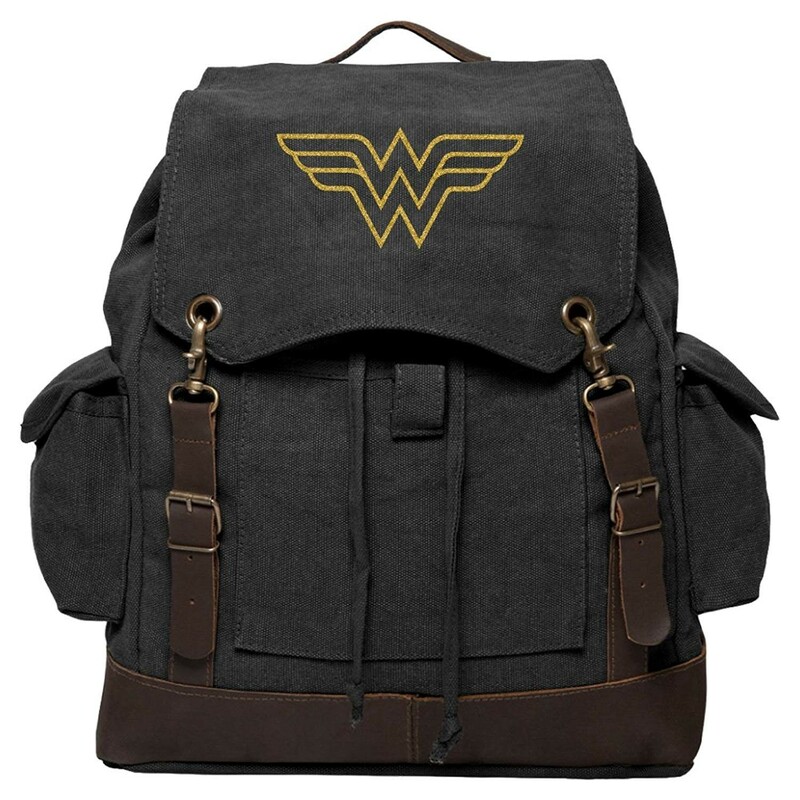 This Wonder Woman backpack shows off the iconography of the character as she appears in Batman vs. Superman: Dawn of Justice — and, of course, her own film! Made from super durable polyurethane, this 18 by 19 inch backpack even includes a lasso detail on the zipper pulls. It's perfect for any dedicated comics fan, young or old. You won't feel like you're falling down the rabbit hole with this backpack to help keep you organized! 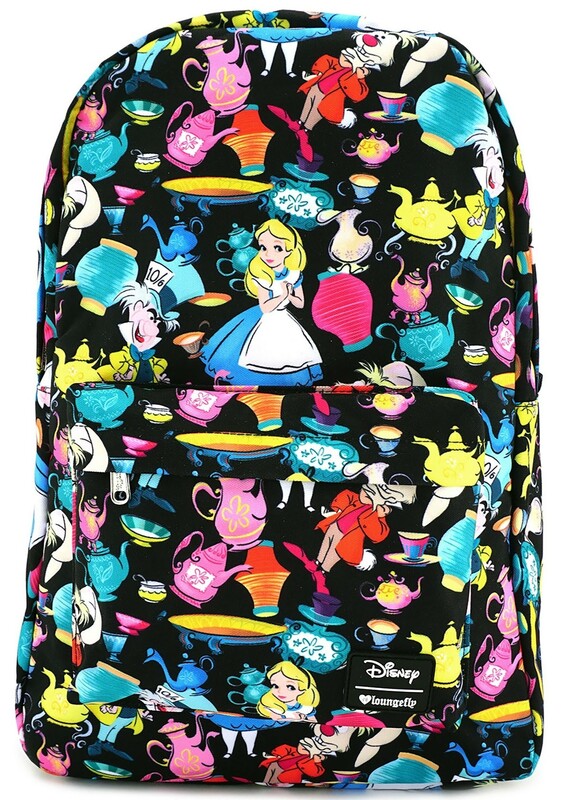 This allover Alice in Wonderland print backpack from Loungefly is 17 by 12 inches, with a 9 by 7 inch front zippered pocket. A large padded laptop pocket inside keeps your tech safe when you're on the go. And thanks to the sturdy canvas construction, you can be confident it will last through the year. Is it bigger on the inside? 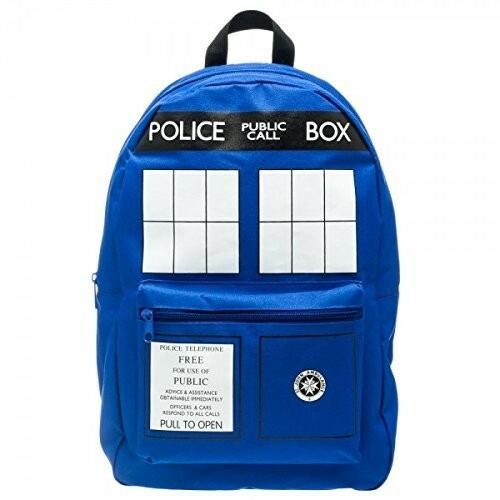 This TARDIS backpack is sure to be a hit with Doctor Who fans! 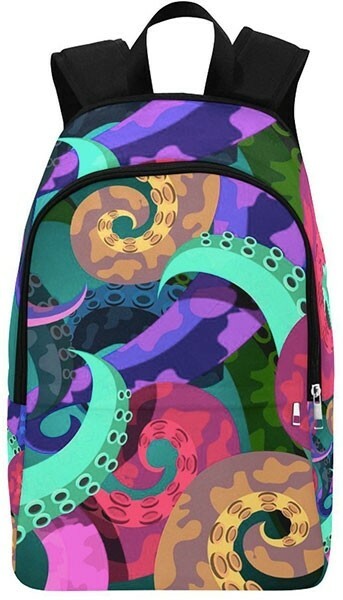 This 100% polyester backpack is 16 by 13 inches and includes a front zippered pocket to keep you organized. Vibrant colors and great details make this backpack accurate enough to please any fan. Allons-y! 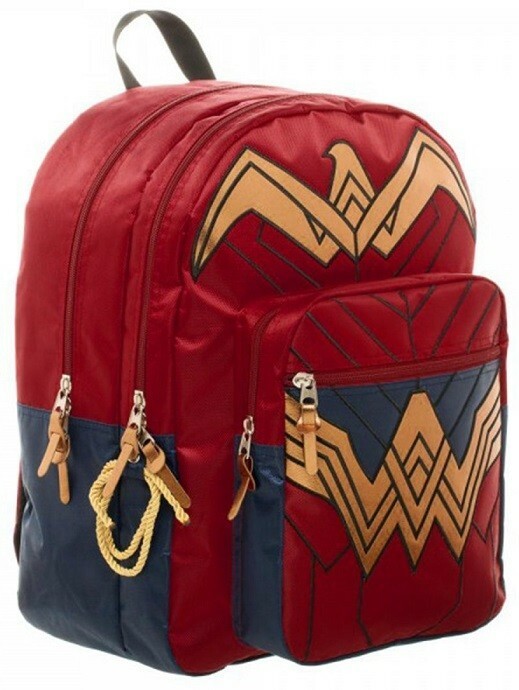 Channel your inner Amazon when you wear this Wonder Woman laptop backpack! This 18 by 12 inch backpack includes flash reflective gold trims for nighttime safety, and the dark red and blue Wonder Woman breastplate-style front features an antiqued metal Wonder Woman badge and Themysciran eagle. The interior includes a separate padded 15-inch laptop pocket and large carry capacity with internal organization pockets. 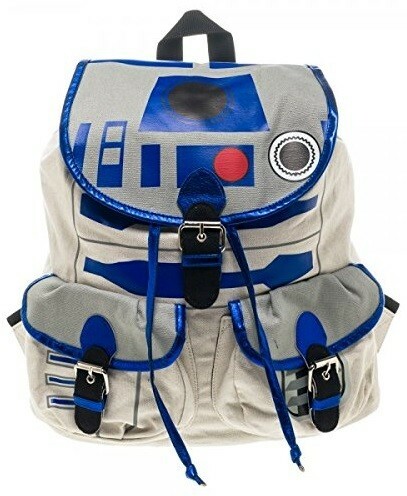 Show off your love of this spunky little droid — and the Star Wars franchise — with this R2D2 knapsack from BioWorld. This 100% polyester knapsack has a drawstring closure and features two front pockets for storing a couple of extra bits and pieces. Adjustable straps make it comfortable — which is a good thing, since you'll want to wear it everywhere! This is one super backpack! The 17 by 13 inch Incredibles SuperBreak backpack comes in seven limited edition prints featuring everybody's favorite crime fighting super family. Like all SuperBreak backpacks, it has a large main compartment, front utility pocket, and padded adjustable straps. It's sure to be a hit with fans of the Incredibles, both young and old! For another option for Incredibles fans, check out this Incredibles Backpack with bold graphic styling worthy of Edna Mode. Doctor Who fans will love this sturdy and detailed canvas TARDIS knapsack from Bioworld! 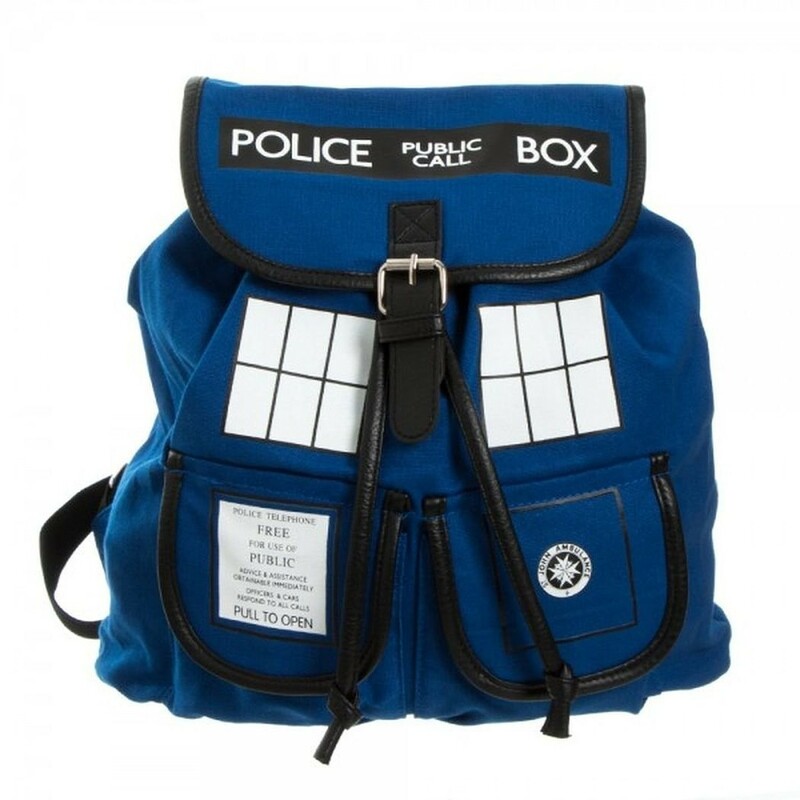 This 15 by 13 inch knapsack includes a drawstring closure and two front pockets — sorry, sonic screwdriver not included. It's tough enough to handle plenty of adventures in school, travel, and more. 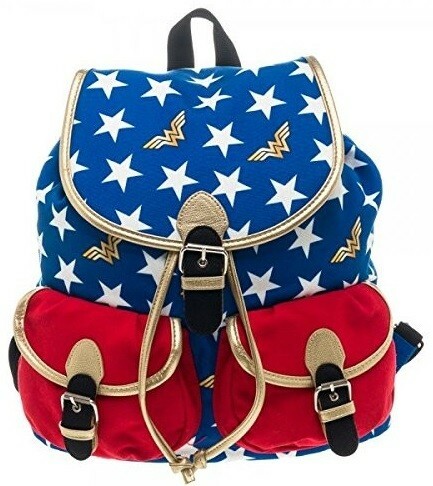 Festooned in Wonder Woman's brilliant colors, this 15 by 12 inch knapsack from Bioworld is perfect for fans of the iconic DC Comics superhero! With a pattern of white stars and a gold Wonder Woman logo on a blue field, accented with red pockets and gold trim, this is a knapsack that really stands out. Let everyone's favorite friendly droid join your Star Wars fan on her school adventures! 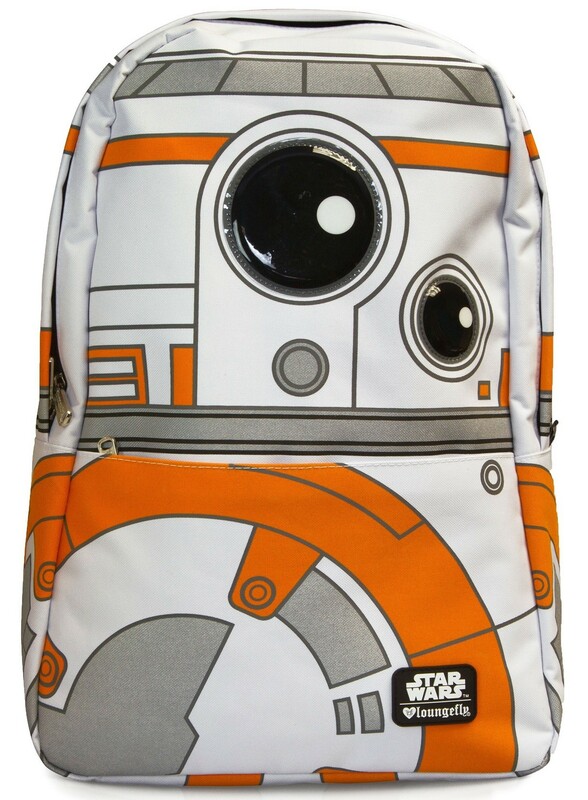 This officially licensed BB-8 backpack from Loungefly is 18 by 12 inches and made of sturdy nylon fabric. The main zippered pocket includes an elasticized pouch for a laptop or tablet, while a small front zippered pocket provides additional storage and organization. Plus, she'll be able to carry everything she needs comfortably thanks to the adjustable straps. 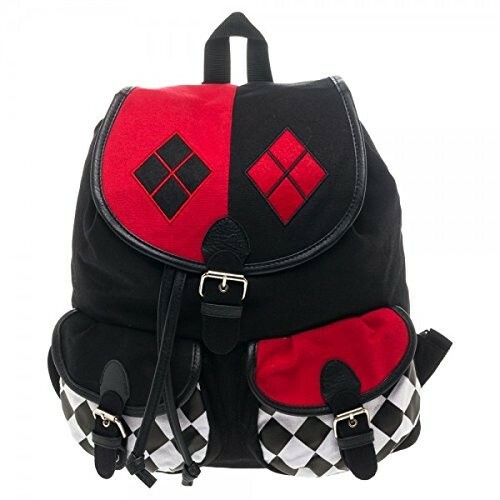 Fans of this complex DC Comics character can pay tribute with this subtle Harley Quinn knapsack design! This 15 by 12 inch knapsack has two small outer pockets and a drawstring closure on the main compartment. Plus, thanks to the sturdy fabric and construction, it's ready to last for the long haul. Watch out: the Mistress of All Evil is watching you! 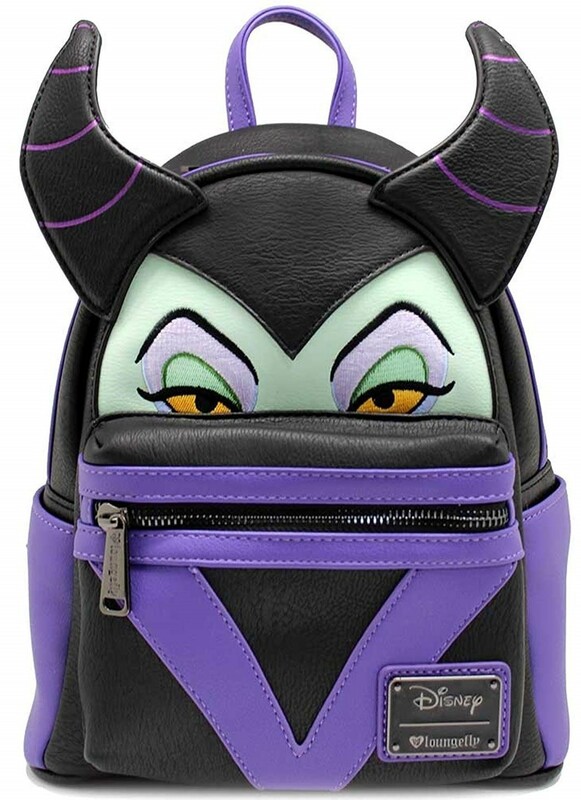 This faux leather mini backpack from Loungefly features the classic Maleficent design. At 13 by 10 inches, it's sized to carry a few necessities but compact enough to be out of the way on a crowded bus. Embroidered features and dimensional horns make this backpack really stand out! 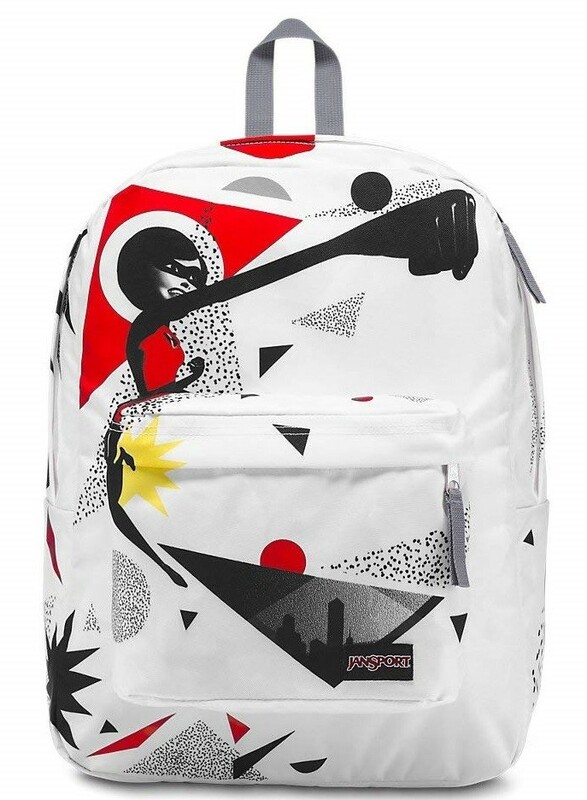 For more pop culture backpacks from Loungefly, check out these ones featuring Rey and Rogue One from Star Wars, Sally from The Nightmare Before Christmas, and Captain Marvel from Marvel Comics. 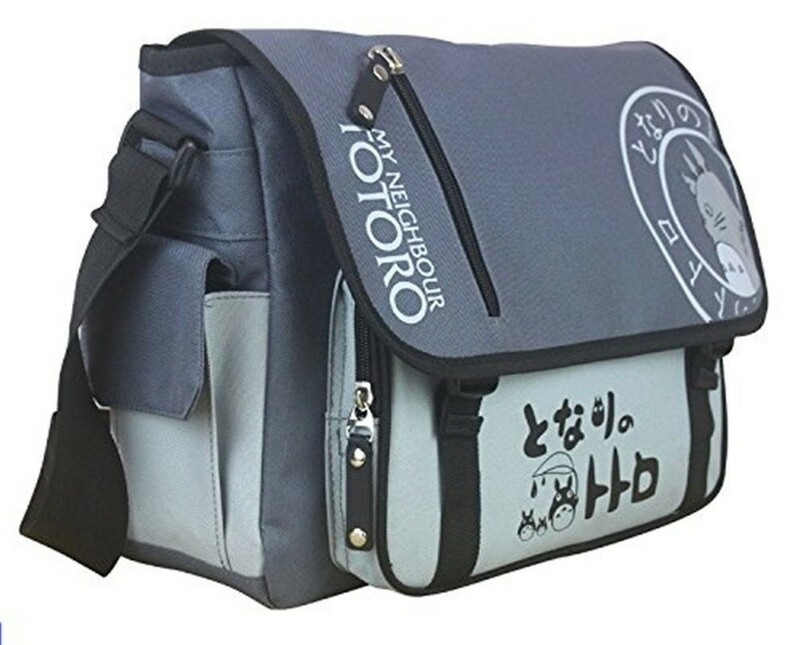 Let Totoro keep you company on the road with this large, well-organized messenger bag featuring the mascot of Studio Ghibli. This durable grey messenger bag is 19 by 16 inches and comes with an adjustable shoulder strap. With zippered and flap pockets in multiple places, plus a top flap that clips closed, you'll easily be able to access items when you need them, and keep them secure when you don't. 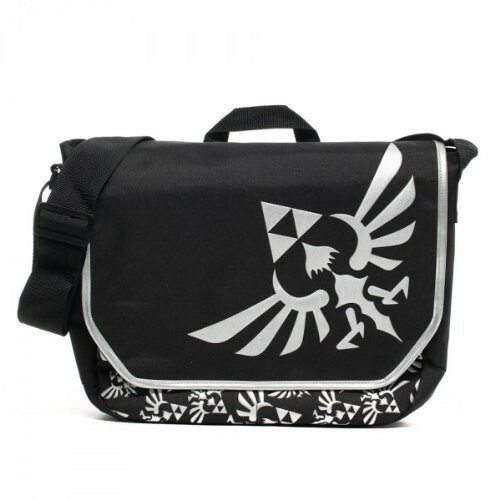 Take the Triforce with you everywhere you go with this messenger bag that plays homage to the classic video game series! This officially licensed 16 by 12 inch bag is black with silver images and trim. Two inner sections allow you to keep items in order, and one of them provides a strap to hold a laptop up to 15 inches. A small zippered compartment provides easy access to a cell phone, bus pass, and other necessities. Are you part of the Rebel Alliance? Star Wars fans will love this officially licensed Star Wars backpack! At 21 x 12 inches, it's big enough for multiple textbooks and binders, and it includes a dedicated laptop compartment. Several front and side pockets provide storage for even more stuff. May the Force be with you! For Mighty Girls heading off on their first day of school, check out our blog post The Big Day: 25 Picture Books About Mighty Girls Starting School. For books to guide elementary school Mighty Girls through some of the challenges and adventures they'll encounter, visit our blog Back to School Time: 40 Books About Mighty Girls' Adventures at School. For guides to help tweens and teens set out on a new year of adventure, check out our 50 Essential Guides for Mighty Girls in Middle School, High School, and Beyond.